Join Esquire at Rabbit Hole Distillery May 4th for the greatest Derby closing party in the city. 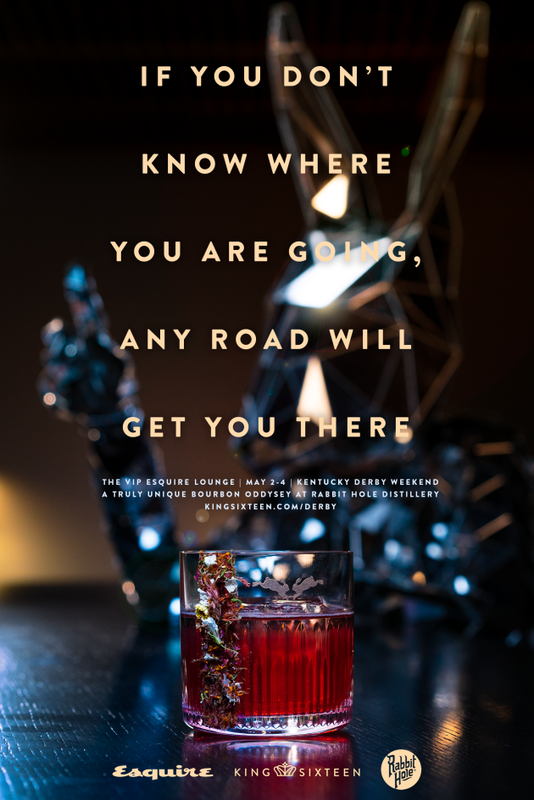 Roam the most modern and immersive bourbon distillery with open bar top craft cocktails, artistic installations and quality entertainment programming hosted by Esquire. Not only will you get the royal treatment for the Derby Closing party for 2 persons, but you will really party in style with access and open bar in the Esquire Lounge at Rabbit Hole Distillery with access Thursday May 2 through Saturday May 4 1pm to Midnight. PLUS, you will get one (1) complimentary $1,100 "Looking Glass" Cocktail created by the famed Death and Company team: featuring Rabbit Hole Straight Bourbon Whiskey Finished in PX Sherry Casks, Looking Glass is made with D’Aincourt Cognac Extra, a fine, aged cognac made from vintage grapes and Bowmore 1989 Silver Seal 21 Year Old, a rare Islay Scotch whiskey, and includes a dash of Belgian chocolate bitters. The opulent presentation is made with a 19th century syphon which releases a plume of fog as the ingredients are steeped. We guarantee this will be an experience like none other!